Nicolas, is the bar manager at Bespoke, Paris. He makes for us two cocktails, one with tequila and cointreau and the second one with rum and basil. I’m Nicolas Munoz, 26 years old, I am from Marseilles and I manage Bespoke, Paris. I was born in a bar/restaurant that my parents owned in Marseilles, so I grew up in a hospitality atmosphere. I started at law school and used to work in bars and restaurants, but never in a cocktail bar. I even worked in a pub, in fact my first cocktail bar is this one, that I’ve opened. I was passionate about the cocktail world, but I was only making them at home. I read some books, like the craft of cocktails by Dale Degroff, did some research on the internet: through blogs, websites, youtube for techniques… I am a self-made man. I was thinking of opening a place by myself 5 years ago, but it took me longer and I opened this place a year ago. I like the contact with customers and being dedicated to people. I think we are building the place of my dreams, even if it’s a little bit small. It’s more about my clients and the team. The right combination is very difficult to set up. People who share the same vision, work together well without egos. Of course it could be different here with more money, but with too much you don’t achieve the authenticity, you just use your money. If I could the bar would be a bigger square place, but still have a food element with indy and pop rock music. Different playlists everyday, because when you work at the same place, you want to constantly hear different music. I’d also like a lot of space and a big bar at the back that you can see when you walk in, with stairs in the corner and a balcony above the bar. The interior would be a mix of wood, stone and leather. So, when I get out, I enjoy wine bars with fine food. Something different, quiet to take a break. In fact, I don’t even have a lot of time for myself out of my bar. Personally I am not a big fan of gin. I prefer whisky, but in the end I can see a lot of our cocktails are gin based. So I try to mix whisky and gin. It makes the whisky more soft and round with a floral touch. Otherwise, I like different flavoured gins. Of course it’s about the balance, but I think the texture is important too. Even if it’s liquid, you need to feel something with consistency in your mouth. I love at this moment grappa. It’s new for me, and it’s strong and soft at the same time. It has a fruity taste you can’t find anywhere else. What is surprising, is that it’s a white spirit, so normally it’s more rough and here you have the feeling that there is syrup in it. 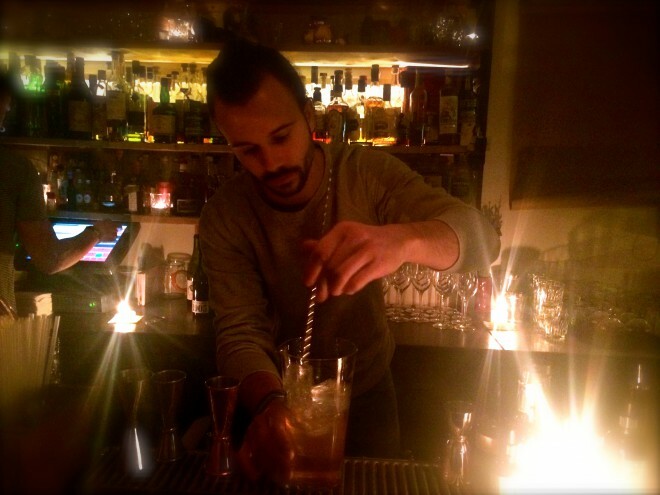 I think service is key, and I went to Little red door, one year ago and we waited half an hour because it was packed, but in the end we were happy because, Piotr, the bartender welcomed us with a big smile, took care of us and made a quality drink… he made this moment special. Plus the stools are more comfortable than my bed.